With the capture of Rukia a done deal and the Soul Reapers about ready to punish her for the crime of saving lives in an unconventional way, can even Ichigo's strong spirit make a difference? Shown the limit of his powers by his betters and taken almost to the brink of death, what more can Ichigo do, let alone his soul-sensitive friends Chad and Orihime? There may be one last hope to save Rukia, but are Ichigo and his friends ready to pay the cost? 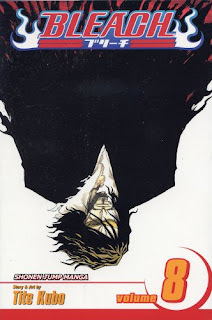 Find out as we round out the beginning of the story of Bleach! These two volumes were definitely better than my return to the story with Volume 6. There's a stronger sense of mystery, as we begin to see that the Soul Society isn't as beneficent as we were led to believe by Rukia. Ichigo's amazing power is shown to be almost nothing against those of experienced soul reapers, and members of the cast must start making decisions that will affect them for the rest of their lives--potentially shortening that life in the process. These are the kinds of things that make a shonen story interesting to me. Sure, there's the usual battling, with each fight happening at roughly the same place in the narrative. But this time around, we also get added drama that puts the formula for shonen in the background. It's what attracted me to the Bleach anime in the first place, and I was worried that it was going to start evaporating from the manga. 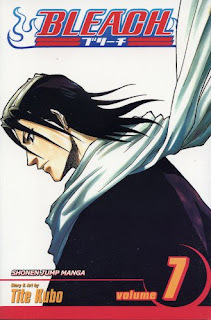 Fortunately, Kubo steers us back on track here. I hope that pace keeps up as the story continues. I think it's interesting that inherent in this story is that Ichigo, Chad, and Orihime must all give up their childhood here, making a very adult decision. Further, it's implied that they are all going to lie to their family and friends in order to do this. I wonder at the potential consequences for the decisions made here and if Kubo will pick up on that later. It would definitely make for an interesting story arc for me, but maybe not so much for the target audience. I guess only time will tell. There's definitely a lot of darkness in this portion of the manga, but we also get some good comedic set pieces. Ichigo tries to escape a trap by running up a wall, Roadrunner-style, for instance, a good example of the continued use of physical comedy to lighten the mood. There's also some verbal wordplay here and there, usually at Ichigo's expense. It definitely helps take the edge off the overall story, which is starting to get extremely serious. I also thought that the artwork was better this time around. I had an easier time understanding what was going on during the battle scenes, and there were some pretty neat moments, such as when Ichigo is falling amid the blocks of his life or as his soul chain is literally being eaten away. There's also good work with facial features here, using eyes and grimaces to compliment the plot and text. Kubo's probably one of the better shonen artists that I read regularly. After being a little worried by volume six, I'm glad to see that these two trades are more in line with what I expect from a shonen manga. I'm definitely interested to see how Kubo handles the next part of the story, even though I'm familiar with it from the anime. There's a lot of cool moments coming up, and it should be a fun ride, as long as there are more books like these two and less like volume six.